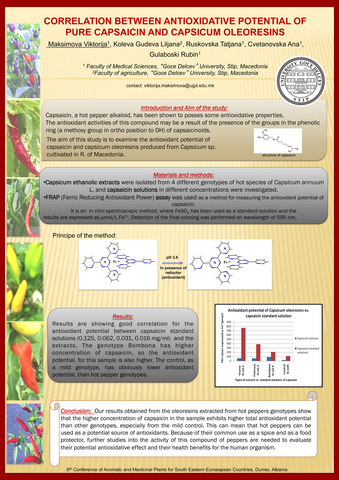 Maksimova, Viktorija and Koleva Gudeva, Liljana and Ruskovska, Tatjana and Cvetanovska, Ana and Gulaboski, Rubin (2014) Correlation between antioxidative potential of pure capsaicin and capsicum oleoresins. In: 8th Conference on Medicinal and Aromatic Plants for Southeast European Countries, 19-22 May 2014, Durres, Alabnia. Capsaicin is a biological active component which can be isolated from the fruit of hot peppers. It has been known for its analgesic, antireumatic, antiseptic, antidiabetic and few more pharmacological properties. Its antioxidative potential is also a subject of many experiments, in the last few years. The aim of this study is to examine the antioxidant potential of capsaicin and capsicum oleoresins produced from Capsicum sp. cultivated in R. of Macedonia. This experiment comprises four different genotypes of Capsicum annuum L., which were used for obtaining ethanolic oleoresins. Their antioxidant potential was measured and compared to the antioxidative potential of the pure capsaicin standards. As a method for measuring the total antioxidant capacity was used FRAP (Ferric reducing antioxidant potential) method. This is a simple photometric method for estimation of in vitro antioxidative potential which is expressed as µmol/L Fe2+. As expected from the previous findings of capsaicin, results from this study are also showing that it posses antioxidative potential that is not so high. But, there is a good correlation between antioxidant potential of capsaicin and capsicum oleoresins in addition of the capsaicin content measured in oleoresins. The results are showing that antioxidative potential of hot peppers does not come only from the vitamins and phenolic compounds in them, but alkaloids (capsaicinoids) are also included.